Earlier this year in The New York Times, I discussed the fact that Democrats are increasingly embracing progressive positions on racial justice and that this has pulled the party to the left as well. White people in the United States have certain advantages because of the color of their skin. Race plays a major role in the type of social services (such as healthcare or education) that people receive in the United States. The Irish, Italians, Jews and many other minorities overcame prejudice and worked their way up. Blacks should do the same without any special favors. Congress should abolish Immigration and Customs Enforcement, or ICE. These questions come from a range of social science batteries. We also included a battery of questions about how many activist activities such as calling a representative, donating to candidates, protesting, running for office, signing a petition (there were 15 activities in total). About 18 percent of Democrats reported that they had not been involved in activism, while about 40 percent had participated in 1 to 3 of the activities that we asked about. About 12 percent of Democrats participated in eight or more of these activities. The chart below shows that activist Democrats are far more likely to agree that white people have advantages. Activist Democrats are also more likely to believe in structural racism, the idea that race plays a role in the distribution of social services. And activist Democrats more likely to reject the idea, referred to as “racial resentment,” that black people simply don’t work hard enough. 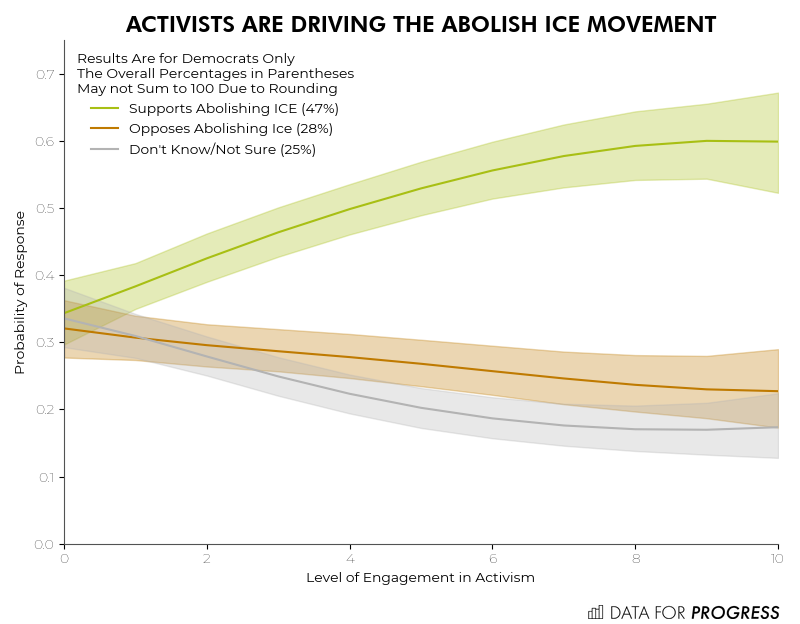 As the chart below shows, activist Democrats are also more likely support abolishing ICE. This is important: activist Democrats are far more likely to have influence over the primary process and be crucial gatekeepers for elected office. These data suggest that activists will push the Democratic Party in a more progressive direction. This is what we saw in the major primaries last cycle, where women of color supportive of abolishing ICE unseated white male incumbents who were opposed to the idea. With young progressive Democrats like Ocasio-Cortez calling for the party to be more accepting of primaries, it’s likely we’ll see a further shift of Democrats in safe blue districts. Data for Progress/YouGov Blue polling of 1,903 Democrats, fielded October 11-15 online and weighted to be nationally representative of Democrats.